Accueil/Actualite/Les impôts : Comment gérer la double Taxation? 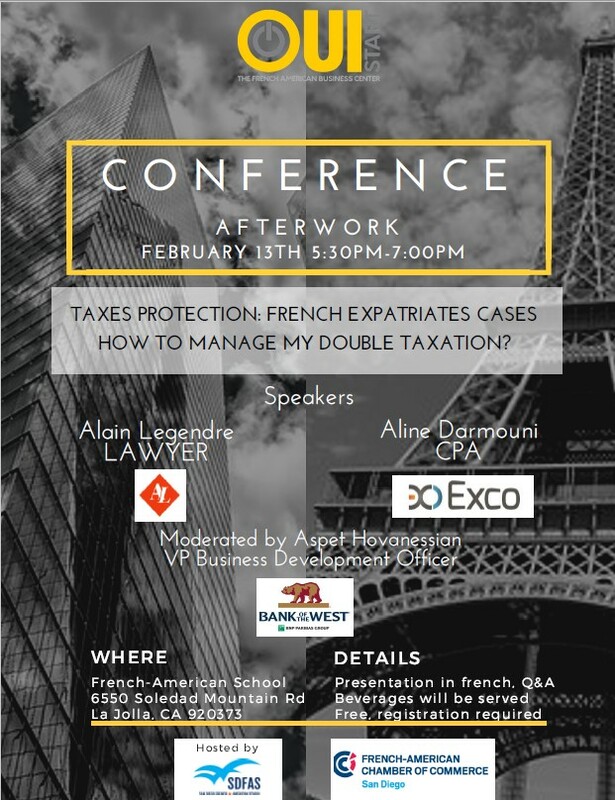 We invite you to join us for an informative and interactive conference on bilateral taxation agreements between France and the US. This conference is a great opportunity to gather case-study based insight. Please note that the conference will be held in French. If you have any specific questions, please send them to [email protected] before the presentation. Aline Darmouni, founder and CEO of Exco US ATRIUM is a Certified Public Accountant in the United States and Chartered Accountant in England. Since 2010, Aline Darmouni has been advising French companies and investment funds in their strategies of implantation in the United States or their CEO in their decisions of management and investment. Subject: How do the US-France Income Tax and Estate Tax Treaties protect you from taxation in France? Alain Legendre has been a French Attorney at Law and member of the Paris Bar since 1997. He has extensive experience working in French public institutions such as the office of Prime Minister and Ministry of Industry. A specialist in tax litigation, he has been practicing for more than 20 years including before the highest French Courts : Conseil d’Etat (Council of State) and Cour de Cassation (the final court of appeals). Aspet Hovanessian, VP business Development officer, International banking group. Bank of the West, headquartered in San Francisco, is a subsidiary of BNP Paribas which has a presence in 75 countries with more than 189,000 employees. The company provides a wide range of personal, commercial, wealth management and international banking services. Par EXCO US ATRIUM|2018-03-15T13:00:53-04:00février 5th, 2018|Actualite|Commentaires fermés sur Les impôts : Comment gérer la double Taxation?